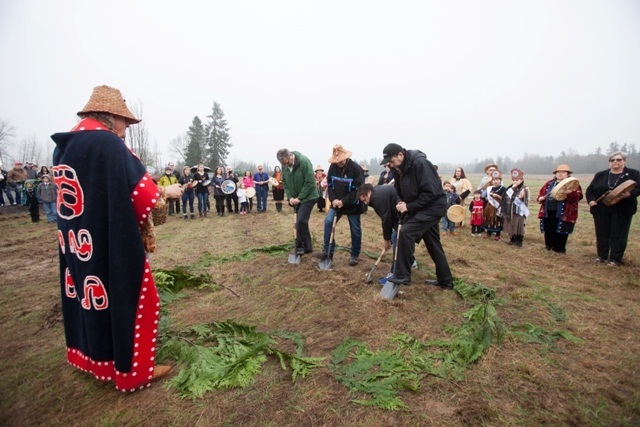 On February 14, Swinerton Builders Seattle joined the Cowlitz Indian Tribe on its reservation land in northern Clark County, Washington, along with development partner The Mohegan Tribe for a groundbreaking ceremony commemorating the start of construction on the new Cowlitz Casino resort and entertainment facility. The celebration featured traditional Cowlitz and Mohegan spiritual ceremonies, drum circles, and a line of speakers who helped celebrate this important milestone. Approximately 500 people were in attendance including: representatives from the offices of U.S. Senator Maria Cantwell and Senator Patty Murray, past and current state legislators, city officials, former Clark County commissioners, Clark County Fire & Rescue commissioners, local residences, and leaders of the Cowlitz Tribe and The Mohegan Tribe. Located on the 152-acre Cowlitz Reservation, Swinerton is currently providing construction services on the 368,000-square-foot project. Once complete, the casino will feature gaming, dining, entertainment, and a meeting facility. The premier new gaming and entertainment destination will open its doors to the public in spring 2017.